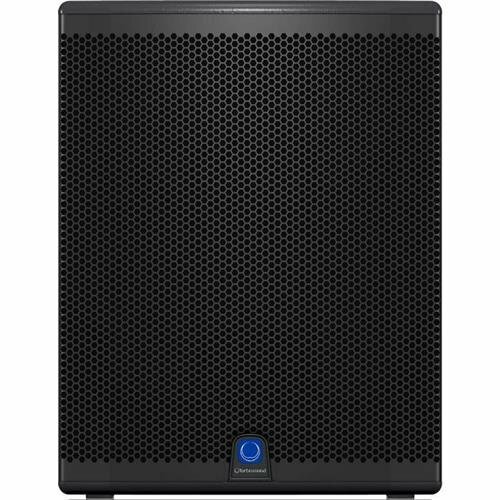 Respected among both touring concert professionals and live music fans for their superb, high-grade sound systems, Turbosound pours its decades of experience into this powerhouse of a subwoofer. The deep, thumping heartbeat of the iQ18B is its efficient KLARK TEKNIK Class D amplifier, pounding out an incredible 3000W of ground-shaking power. Its perfect for both mobile applications and permanent installations with heavy low-end demands. Built tough for the rigors of the road, the iQ18Bs 18 in. driver is enclosed in a rugged birch cabinet for clean, tight sound and long-lasting durability. The enclosure is finished in a hard-wearing, semi-matte black paint and fitted with a tough, powder-coated, perforated steel mesh grille, 35 mm pole mount to support a satellite speaker, and plated steel casters with rubber tires. Mains power input and link output is provided via Neutrik powerCON connectors. The high-excursion, 18 in. driver with a double-suspension, low-mass 4 in. voice coil provides fast and accurate transient response for virtually distortion-free operation, even during the most demanding performances. The iQ18Bs KLARK TEKNIK Digital Signal Processor (DSP) provides dynamic EQ and transparent limiting for the utmost punch and definition at high output levels, as well as long-term reliability. Turbosounds proprietary ULTRANET technology allows the use of CAT5 cables for transmitting pristine, multi-channel audio signals and other information between ULTRANET-enabled products, such as digital mixers. This digital distribution networking not only eliminates the potential for RFI and crosstalk but also significantly reduces the setup or installation time. An onboard USB port provides access for remote control of the iQ18B via PC, as well as DSP and speaker modeling firmware updates. If you have any questions about this product by Turbosound, contact us by completing and submitting the form below. If you are looking for a specif part number, please include it with your message.